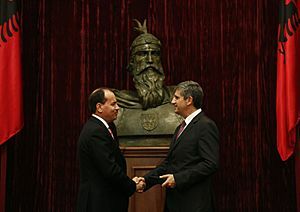 Bujar Faik Nishani (born 29 September 1966) is an Albanian politician. He became President of Albania in July 2012. Bujar Nishani was born in Durrës, Albania. In 1988 he finished the Military Academy "Skënderbej". In 1996 he followed his master studies in San Antonio, Texas and California. In 2004 he graduated at the Law Faculty of University of Tirana. He completed his master in European Studies. He is married to Odeta Nishani and has 2 children. Nishani suffers from a disease. His left hand and his left leg move with difficulty. Bujar Nishani Facts for Kids. Kiddle Encyclopedia.